Ok so before anyone says it, I KNOW we’re still in October but let’s face it, the way this year is flying by Christmas is going to be here before we know it! I’ve been having so much fun over the past few weeks experimenting with new Christmas recipes to share with you guys this year and this no bake Christmas Jelly Slice is certainly one of my favourites! The magic of this Christmas slice is spotting the red and green layers when you look at it from the side – don’t be alarmed when you take it out of the fridge and it looks an odd colour – I promise it will look amazing once cut! It’s inspired by my Strawberry Jelly Slice which I made earlier this year and is basically the same recipe just with an extra layer of jelly! 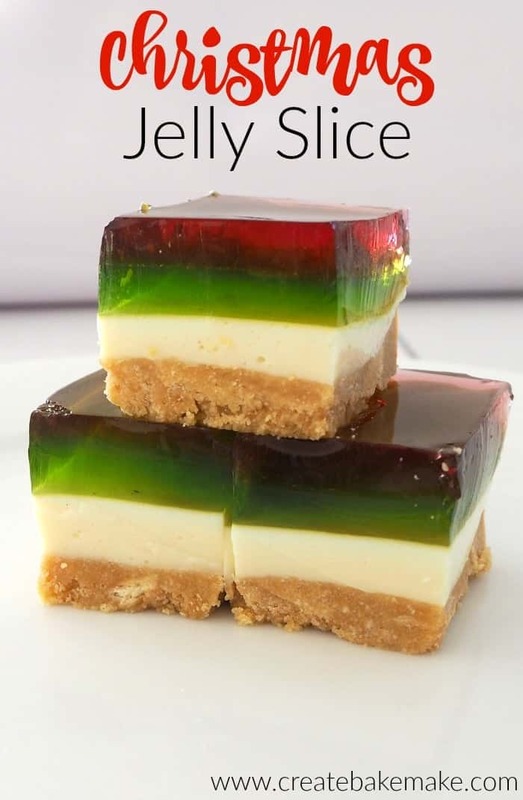 This Christmas Jelly Slice would make a great dessert to take along to a Christmas party or BBQ, however if you are wanting to make it for a special occasion, make sure you begin the recipe a day before you need it. My other big tip is to make sure you use a DEEP slice tray as you want your tin to be deep enough to fit two layers of jelly. I’d also suggest popping your slice tray onto a larger oven tray to move it in and out of the fridge, otherwise you may end up with jelly on the floor which is NOT fun! 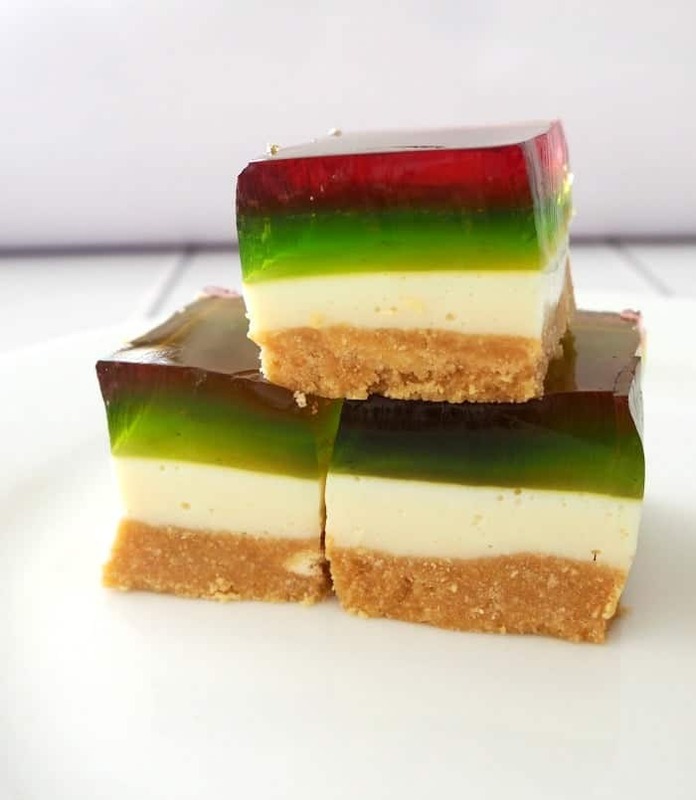 This no bake Christmas Jelly Slice recipe is the PERFECT no bake Christmas recipe! It's a great Christmas dessert or party food and everyone will love the gorgeous layers! It can also be made using a Thermomix - instructions included. 250 grams of Marie biscuits or any other plain biscuit will be fine. Line the base and the sides of deep 28 x 18cm slice tin with baking paper, making sure you leave plenty hanging over the sides. Crush the biscuits, either in a food processor or with a rolling pin by hand until they resemble fine breadcrumbs. Add the melted butter to the crushed biscuits and mix until combined. Pour the mixture into the lined slice tin and press down with the back of a metal spoon until level and place in the fridge to set. Meanwhile, add 2 1/12 teaspoons of gelatine to 3/4 of a cup of boiling water and stir until it has dissolved. Place the condensed milk into a bowl and while whisking, add the dissolved gelatine mixture and the lemon juice. Continue to whisk until mixture is well combined. Remove the set biscuit base from the fridge and pour over the condensed milk layer. Place back in the fridge, until it just begins to start to set – approximately half an hour. Make the lime jelly as per the packet instructions – adding an extra teaspoon of gelatine. Allow the jelly to cool until it has reached room temperature. Remove the slice from the fridge and place it on a baking tray as this makes it much easier to move in and out of the fridge. Carefully pour the lime jelly over the slice and place it back in the fridge to set approximately 3 hours and is should be fine. Make the strawberry jelly as per the packet instructions and add an extra teaspoon of gelatine. Allow the jelly to cool until it’s room temperature. Remove slice from the fridge and carefully pour over the lime jelly layer. Place the slice back into the fridge - preferably overnight to set. Try to use a deep sided slice tin for this recipe. I also suggest you place the slice tray onto a baking tray to make it easier to transfer to and from the fridge. To make the filling, combine the gelatine in a jug with the boiling water and allow to cool slightly. In a clean bowl, add the lemon juice and condensed milk and mix for 45 seconds on speed 4. After 5 seconds, remove the measuring cup and carefully pour the gelatine mixture in. Remove the set slice base from the fridge and pour over the filling. Put back into the fridge for 30 minutes. In a clean bowl, add the hot water and heat for 3 minutes on 90 degrees speed 2. Add the jelly crystals and one extra teaspoon of gelatine and stir until they have dissolved. Pour jelly into another bowl and allow it to cool until it has reached room temperature. Remove the slice from the fridge and carefully pour the jelly over the slice and place it back in the fridge to set for approximately 3 hours. Prepare the strawberry jelly as per the previous step and carefully pour over the set lime jelly layer. Place the slice back into the fridge – preferably overnight to set. For more simple no bake Christmas recipes, check out our eBook store and grab a copy of our no bake Christmas recipes ebook which is also available in a Thermomix version too. This is awesome!!!! You clever thing, you!!! Love it! Need help!! Tried to make this and got to the jelly layered on the condensed milk. How do you get it to stay just on top of the condensed milk, cause mine went everywhere? I love the Christmas colours – the just looks so jolly! This year IS flying by Lauren! 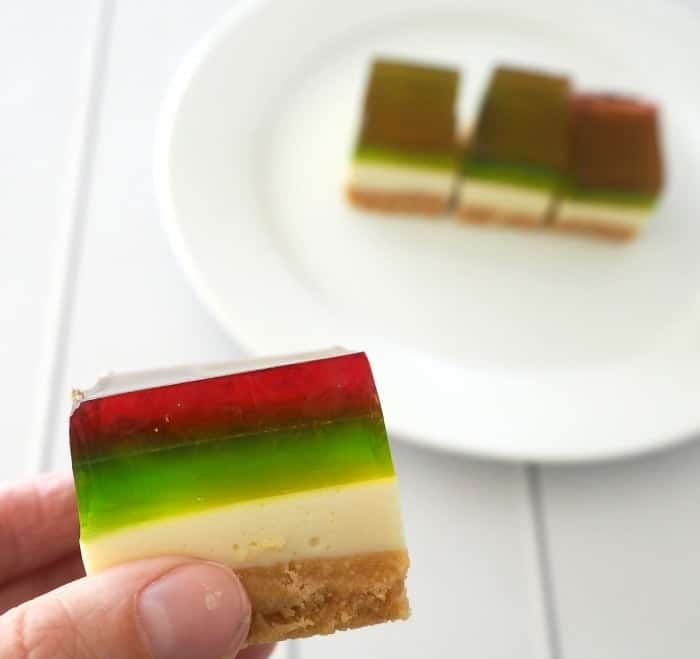 Loving this gorgeous Christmas jelly slice – what a brilliant idea! Holy moley, that’s going to busy! Lauren, this is off the hook amazing. You’ve excelled yourself yet again, lovely lady. 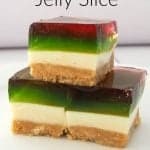 that’s a fun way to make jelly slice – but I am keeping my head in the sand about christmas just for now! Hi Chris, Is that in place of the butter, or as well as adding the butter? Wouldn’t that make it a bit sticky? Thanks, Kay. Hi Kay, I’m assuming it’s as well as the butter. Do you kmow how long this lasts? I’m planning on baking some of my gifts, but I want to make things that are going to last longer than the leftovers, or they won’t get eaten. Hi, in step 4 it says to add 21/12 teaspoons of gelatin? I’m guessing you mean 2, 1/2 teaspoons? Yes that’s right Trish, I’ll fix that up now! Hi Lauren…I’ve made this one once or twice and love it but with some new requirements for family members i need to know if you have an alternative to gelatine? Do you know if there is a suitable alternative for vegetarians? Thanks so much for the great tips ! Oh! Thank you! This is perfect! I am in Sri Lanka and trying to find Christmas recipes that do not require an oven! This is just the ticket!!! I’m making this as a gluten, citrus and dairy free slice. I’ve swapped the Marie biscuits for gluten free scotchfinger biscuits, then 50g each of cashews and macadamias which I’ve turned into crumbs. I used half the amount of butter but used nuttelex instead of butter. I’ve not added the lemon juice but have added a tsp of vanilla instead. I can’t wait to eat it tomorrow! It was fabulous! The base was too rich and oily though, so If using nuts, I’ll have to quarter the nuttelex I think. I followed the instructions as written but swapped for Pandaroo Condensed Coconut Milk instead. I’d post I photo if that was an option. It held together beautifully.